Eau de Paris, the non-renewal of the contract is due to "technical" reasons. During his visit to Israel, François Hollande declared before the most prominent Israeli political representatives: “Till today, you have never yielded when it comes to democracy, diversity, and human rights”. One must bear in mind that the State of Israel has consistently defied international law. 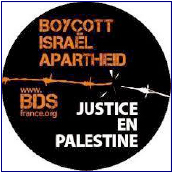 A court in Perpignan, south-western France on Wednesday found three pro-Palestinian activists not guilty of discrimination and hate crimes, after they called for a boycott of Israeli products during a protest at a shopping centre. The court in Perpignan upheld a recommendation from prosecutors that the three be found not guilty for the boycott call, made during a protest at a shopping centre in the southern city in 2010.